You are The Future Shapers. 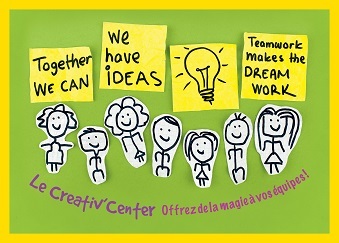 Le Creativ’ Center, through its different meaningful projects, has at heart inventing with you a positive, joyous and colorful future! To feed your imagination at every moment, go through these 80 eclectic articles of Sparking Rendezvous on innovation happening everywhere throughout the world! Under this heading, boost your inspiration with novelties that blow your mind! - Here are plenty of other articles about Today’s Inventions! Revisit our ancesters’ fabulous inventions which have changed our lifes and continue to impress us today. -	Your daily life is extraordinary! First of all, creativity is a mindset. How to come up with pertinent and original ideas and have the audacity to make them happen? Meet these challenges; find solutions and invent creative responses by yourself and with your team! -	How to cultivate your sense of humor in your company? -	How can we turn the boring parts of our job into something really enjoyable? -	What can we do to maintain a tremendous atmosphere within our team? - Looking for other challenges? Click here! Want to go further on your creative exploration? Visit Lleo Magic’s Creativ’ Lab and meet our funny, inventive and engaged lion! -	Lleo Magic, your super hero of Creativity that comes to save us from the terrible syndrome Lackus Ideus! -	Lleo Magic invites you into his magic creative world! We are overflowing with ideas to stimulate your teams’ creativity and to take on your new challenges. How about discussing your new projects with us?